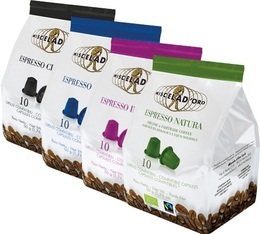 Founded in 1946 by the Urbano family in Messina, Italy, Miscela D'Oro coffee is the result of selecting the best quality green coffees and extreme technical knowledge. For over 60 years, 3 generations of the Urbano family have allowed Miscela D'Oro coffee to evolve while keeping the spirit of a family and artisanal business. Find on MaxiCoffee a range of coffee beans, ground coffees, Nespresso compatible capsules, Lavazza Espresso Point capsules and many more! 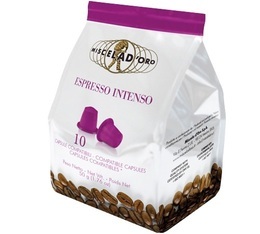 Decaf - Miscela D'Oro - 100 x Espresso Point compatible capsules.